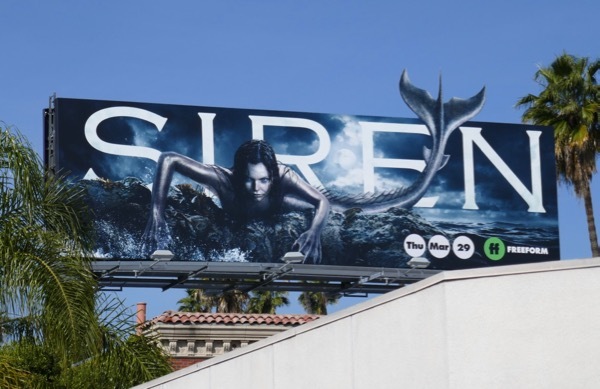 This TV season Freeform is hoping to make a big splash with its new fantasy thriller about mermaids, Siren. In Greek mythology sirens were dangerous creatures that lured sailors to their doom on the rocks, whilst there have been many incarnations of mermaids in popular culture from Disney's 1989 animated movie starring 'Ariel' based on there Danish fairytale by Hans Christian Andersen to Daryl Hannah's 'Madison' in the 1984 comedy with Tom Hanks, Splash. 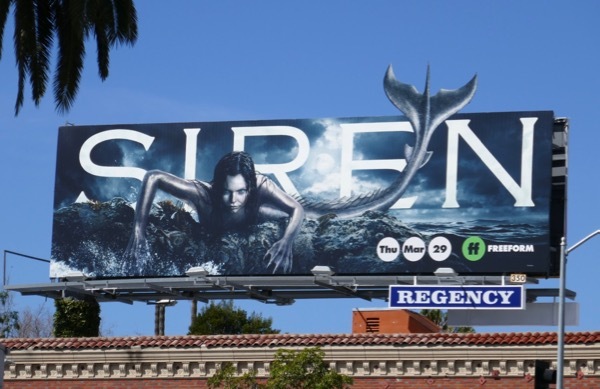 In this new show mermaid legends come to life in the coastal town of Bristol Cove with the arrival of a mysterious girl called 'Ryn' (played by Eline Powell), although this creature with the upper body of a woman and the lower body of a fish looks decidedly deadly with her webbed, clawed hands. Bringing havoc to the mermaid-obsessed fishing town, two marine biologists 'Maddie' (Fola Evans-Akingbola) and 'Ben' (Alex Roe) must work together to discover what this creature is and are there more like her out there in the ocean's depths. 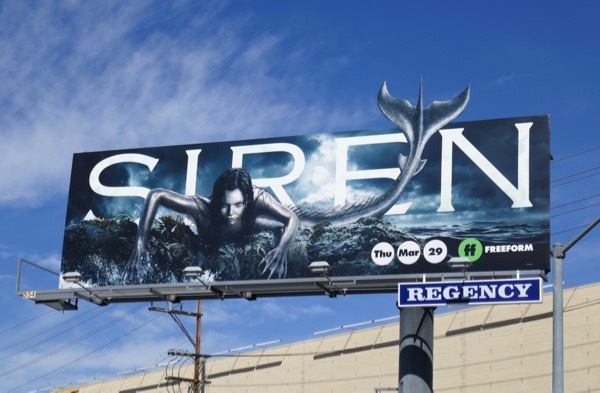 These eye-catching special extension cut-out billboards for the series launch were photographed along Sunset Boulevard and La Brea Avenue from March 9 to March 19, 2018. 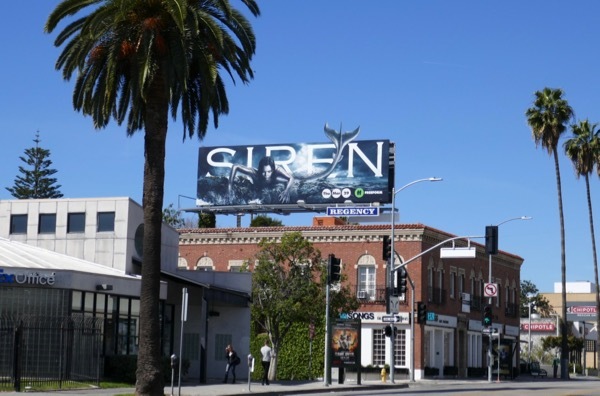 For more mythical creatures from folklore be sure to check out this unicorn billboard, angels in these Dominion billboards and Legion billboards and all manner of fables come to life in these Rise of the Guardians billboards. 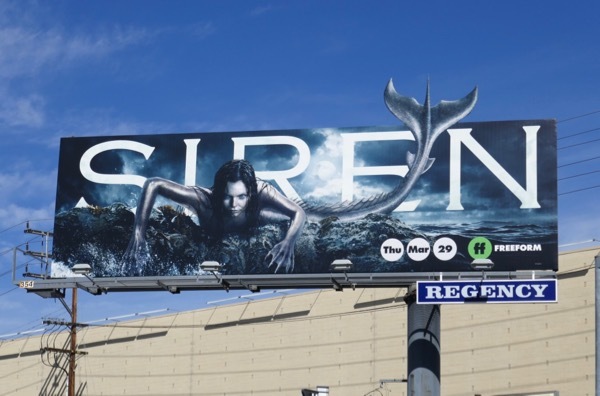 Vampires, werewolves and witches are so yesterday, it's time for mermaids to have their time in the spotlight. 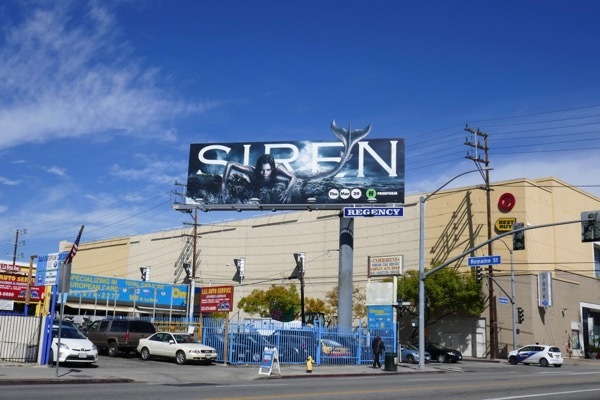 Let's see if this Siren can tempt viewers this spring television season.